Parenting a child with special needs can be overwhelming. We get it. Let us help. 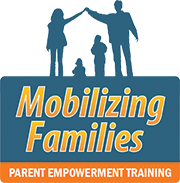 The Arc’s award-winning Mobilizing Families training will help you unlock the mystery of disability resources by giving you the tools and information to help your child thrive. Participants will receive 12 hours of training split into easily manageable two-hour sessions each week. These classes that will build your skills and confidence, empowering you to effectively advocate for your children in all aspects of life. Each series includes an in-depth look at special education, healthcare, insurance, community resources, and so much more! Our next series starts Thursday, February 15. WHEN: Thursday evenings beginning February 15, 2018 and ending March 22, 2018. WHERE: The Arc - Jefferson, Clear Creek & Gilpin Counties, 13949 W. Colfax Ave, Bldg 1, Ste 150, Lakewood, CO 80228. Get directions. BRING: Nothing except your family! We provide all training materials. The Spring 2018 training is almost at max capacity! If you're interested in joining please call Genni at (303) 232-1338 to see if space is available.